Hollywood is still trying to figure out what to do with comedian turned actress Tiffany Haddish. She re-teams with her Girls Trip director Malcolm D. Lee for a PG-13 effort. 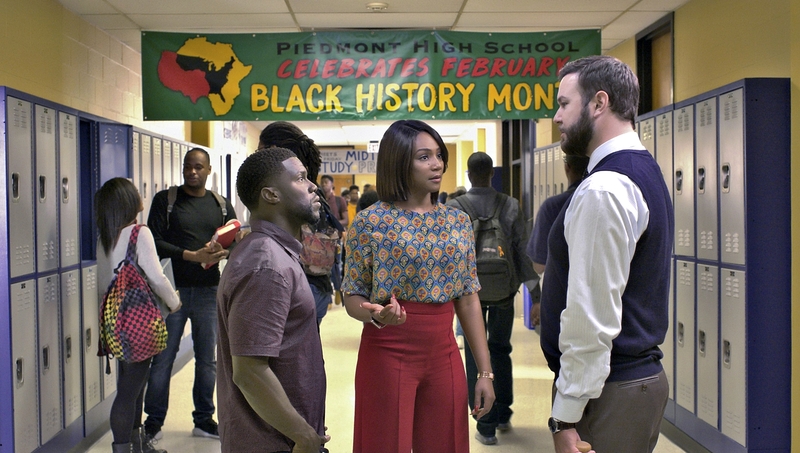 Night School is, unfortunately, another unfunny comedy for Kevin Hart to play in. The screenplay makes an awkward attempt to deliver a message of how its never too late to better yourself, but like most of Hart’s scripts, the nonsense is what gets highlighted. Night School is tame compared to the usual Hart and Haddish flicks, more along the lines of a ‘Madea’ movie, except nothing is funny. What’s worse is Night School looks and feels cheap. It’s a low budget movie, expecting top dollar revenue just because of Hart’s name. For many years Teddy Walker (Hart) has lived a prosperous life despite the fact he dropped out of high school. He’s squeaked by on his charm and his ability to sell anything to anyone. He lives above his means, drives a car he can’t afford and has a girlfriend that is out of his league. When his small business falls through, he’s forced to attend night school to get his GED. Carrie (Haddish) is the no-nonsense, overworked teacher at Teddy’s former high school who is also in charge of night classes. She makes it very clear to the jokester, that the way to pass her class is hard work and no bribes. Teddy falls hard before he begins to take the program seriously, juggling a fast food job during the day while hiding his night classes from his finance Lisa (Echikunwoke). Night School is tame compared to the usual Hart and Haddish flicks, more along the lines of a 'Madea' movie, except nothing is funny. Night School is the film you are sure will eventually get funny, and Haddish will make some perverted wisecrack you can’t help but chuckle over. Sadly, it never happens. Hart wearing a chicken costume on the corner advertising fast food isn’t funny, falling into his Porsche windshield during a really bad CGI explosion isn’t funny, even his obnoxious speech at the end where he says too much, still not funny. Kevin Hart is a one-note actor/comedian. In every one of his films, you can expect his height, and stature to be used for attempted laughs. He plays the same desperate character trying to get out of a jam using same fast-talking antics we’ve seen from him before. Haddish was this movie’s only hope, and when her face starts popping up on the screen giving like a hallucination to give Teddy advice, it’s clear the filmmakers don’t know how to use the comedian. The most enjoyable moment in the entire movie is when Carrie “whups” Teddy with a belt. After sitting through over an hour of Hart doing his mechanical, by the numbers routine, his lack of creativity deserves a good beating. Though Hart accepts himself as a commodity, he will continue delivering cheap laughs as long as viewers pay to see his work. Night School is basic standardized filmmaking that isn’t up to the quality of being shown on a big screen for full price. Haddish can’t save lousy Night School from Hart’s monotonous routine.